This new addition to the Longman Critical Readers Series provides an overview of the various ways in which modern critical theory has influenced Chaucer Studies over the last fifteen years. There is still a sense in the academic world, and in the wider literary community, that Medieval Studies are generally impervious to many of the questions that modern theory asks, and that it concerns itself only with traditional philological and historical issues. On the contrary, this book shows how Chaucer, specifically the Canterbury Tales, has been radically and excitingly 'opened up' by feminist, Lacanian, Bakhtinian, deconstructive, semiotic and anthropological theories to name but a few. The book provides an introduction to these new developments by anthologising some of the most important work in the field, including excerpts from book-length works, as well as articles from leading and innovative journals. The introduction to the volume examines in some detail the relation between the individual strengths of each of the above approaches and the ways in which a 'postmodernist' Chaucer is seen as reflecting them all. 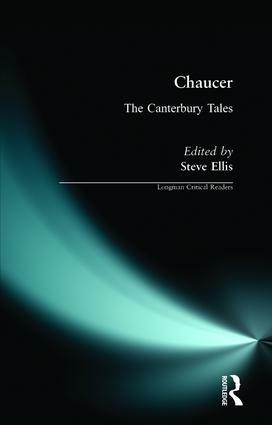 This convenient single volume collection of key critical analyses of Chaucer, which includes work from some journals and studies that are not always easily available, will be indispensable to students of Medieval Studies, Medieval Literature and Chaucer, as well as to general readers who seek to widen their understanding of the forces behind Chaucer's writing.